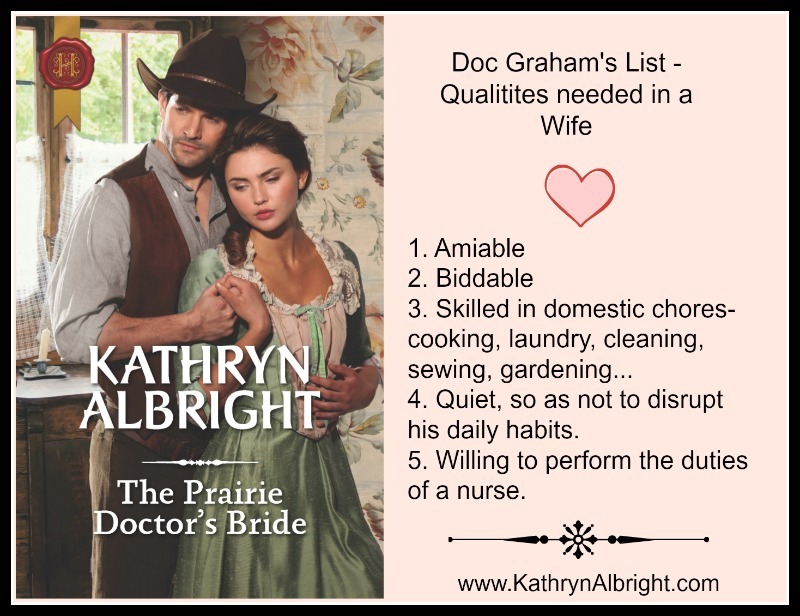 Nelson Graham, the doctor in my latest sweet western romance, the Prairie Doctor's Bride, is in need of a wife (and a nurse.) Growing up in the east, he attended a boarding school and then a university in Boston. 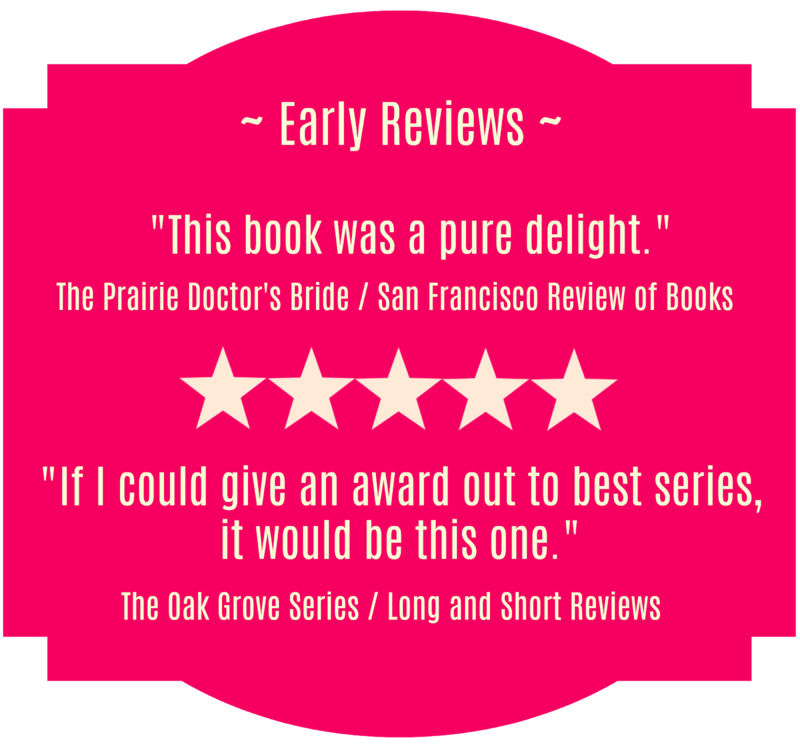 He never had much contact with the "fairer" gender and so when he decides to take a wife in Oak Grove from among the mail-order brides that the town has procured, he is more than a bit out of his comfort zone. 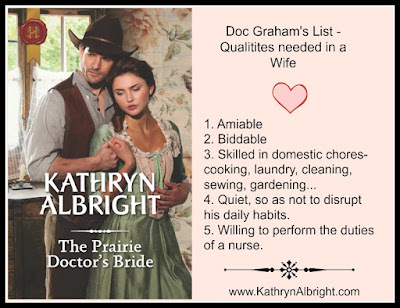 He makes a list of attributes he expects in a wife, but he also wants to make sure she will work beside him as his nurse. He is not expecting a love-match. There wasn't much love in his parent's marriage and so he decides the best he can hope for is a help-mate. The next afternoon he called on Katie O'Rourke. He'd heard good things about her from a few of his more gossipy patients. 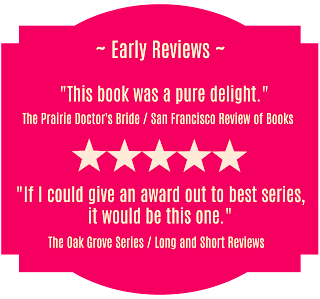 Miss O'Rourke had the start of lines near her pale blue eyes and a more generous girth than the other brides. He was immediately drawn to her pleasant smile and outgoing personality. He invited her to dine with him in the hotel's restaurant. Raising her son alone, penniless Sylvia Marks has had enough of being the subject of town gossip. But when her son is seriously injured she'll do anything to save him…even kidnap handsome Dr. Nelson Graham! Nelson knows what he wants in a wife; she's to be amiable, biddable and skilled in domestic chores. Gun-toting Sylvia Marks isn't what he had in mind, but as the two are forced together he realizes she's exactly what he needs! What a great excerpt! I thought the story would be about the Katie and the doctor, then you surprised me when you added the next information about Sylvia. It is a twist right in this blog. I will have to buy it now. Thanks for a great blog post.